Aqua, Propylene Glycol, Polyglyceryl-3, Caprylate, Polyglyceryl-4 Caprate, Alcohol Denat, Zinc PCA, Arginine, Bisabolol, Glyceryl Laurate, p-Anisic Acid, Melaleuca, Alternifolia Leaf Oil, Citrus, Aurantium Dulcis Peel Oil, Eucalyptus, Globulus Leaf Oil, Lavandula Angustifolia Oil, Rosmarinus Officinalis Leaf Oil, Leptospermum Scoparium Branch/Leaf Oil, Mentha Piperita Oil, Citrus Aurantium Amara Flower Oil, Aloe Barbadensis Leaf, Juice Powder, Hippophae Rhamnoides, Kernel Extract, Rosmarinus Officinalis Leaf Extract, Helianthus Annuus Seed Oil, Vitis Vinifera Seed Oil, Panthenol, Pantolactone, Acrylates/C10-30 Alkyl, Acrylate Crosspolymer, Potassium, Hydroxide, Beta-Carotene, Phenoxyethanol, Ethylhexylglycerin,, Caprylyl Glycol, Limonene, Linalool. All natural ingredients Money back guarantee Free samples available Takes time to see results Strange Odour Can Stain clothes I have been using Salcura's products for quite some time now, I combine the Antiac spray with their Sensitive Face Wash Omega 3,6,7 and 9 formula. Salcura boast all natural ingredients which is what drawn me to their products as I have spent the last twenty or so years bombarding my skin with chemical treatments, as I also suffer from Rosacea I needed a product that would not cause upset to that condition also. The Antiac spray has a strange odour sort of like olive oil, but once I had applied it to my skin I felt really refreshed and clean, I apply it twice daily and have noticed a significant reduction in outbreaks and redness, greasy skin in my T zone has almost become normal but I must stress this is not an overnight wonder treatment I have been using this for over six months, visible difference took between two and four months. 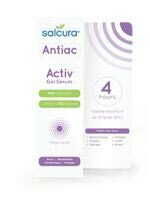 Antiac comes in 50ml 100ml and comes with a 30 day money back guarantee which is not seen very often and if you look on there website you will find they do free samples.